Wise Owl E 505 Probiotic + Prebiotic in powder form consists of 8 friendly bacteria which are necessary for the normal functioning of the gut, along with a beneficial prebiotic. This new upgraded version of our popular Probiotic Powder should be dissolved in lukewarm water and has an activation time of just 1 minute. 3mg taken once a day should give you over a month’s supply. This is the upgraded version of our popular Probiotic Powder with more F-O-S and a quicker activation time – down from 10 minutes to just 1 minute. 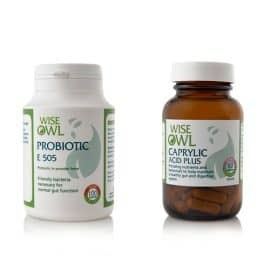 Wise Owl E 505 Probiotic + Prebiotic in powder form, consists of 8 friendly bacteria which are necessary for the normal functioning of the gut, along with a beneficial prebiotic. Our digestive system is home to trillions of bacteria. Our gut ‘micro’ flora is comprised of a mixture of both ‘good’ bacteria & ‘bad’ bacteria. Both bacteria live & work together in harmony until something upsets this fine balance. A healthy gut needs a positive balance of good bacteria. Wise Owl Probiotic is provided as a powder rather than a capsule. During the careful manufacturing process, the bacteria are dehydrated at their most active growth phase. Consuming a capsule into the acidic environment of the stomach would supply the bacteria with acid rather than the water they were originally deprived of, whereas re-hydrating in a glass of water buffers them from the stomach acid & helps them return to their most active phase, where they left off. Pairing the probiotic with our Caprylic Acid formula can really help your digestive system. Our 'Digestive Duo' Health Pack includes Probiotic E505 & Caprylic Acid with 10% discount. Unlike 90% of our supplements, our probiotics are not sold in a whole food form as such, but food extracts grown into a whole food culture of live bacteria, with the addition of warm water. You can also read more about probiotics in our Blog Post 'Probiotics could Change Your Life'. What is the Role of Probiotics? Break down food for digestion. Produce the lactase enzyme, which assists in digesting the milk sugar. Produce vitamins in the intestinal tract. Change the acidic environment, making the conditions less desirable in the intestine for harmful organisms. Why Might You Choose to Take a Probiotic? When the balance of ‘good’ bacteria and ‘bad’ bacteria fall out of equilibrium, health issues may occur. The following list highlights some of the reasons why the levels of beneficial bacteria may decline. The friendly bacteria may naturally age and lose its vitality. A diet high in meats and fats, because they take so long to break down in the body, promoting the growth of ‘harmful’ putrefying bacteria. The use of antibiotics, they indiscriminately destroy both ‘good’ and ‘bad’ bacteria. Constipation allows ‘bad’ bacteria to stay within the body longer and proliferate. Disruption to the acid/alkaline balance in the bowels can reduce the growth of beneficial bacteria living in the intestines. Why Choose Wise Owl Probiotic E505? May help to promote good general digestive health and a feeling of well-being. May help to support the body’s natural immune system. They may help to discourage the growth of bad bacteria, such as, E Coli and Salmonella. May assist in the natural functioning of the digestive process. Help to provide a source of nutrients which include vitamins, B7, B12 and vitamin K.
They have been shown to be beneficial in the fight against urinary tract infections. 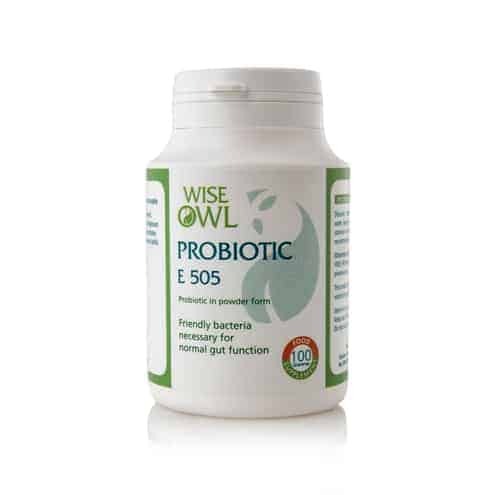 Wise Owl E 505 is a probiotic presented in a powder form. It consists of 8 friendly bacteria which are necessary for the normal functioning of the gut and a small amount of the beneficial prebiotic, Fructo-oligosaccharides. **Fructo-oligosaccharides (FOS) provide nourishment to most types of beneficial/friendly bacteria; FOS is not a source of nourishment for toxic/harmful bacteria. FOS is also known to help increase the absorption of both magnesium and calcium. ***Prebiotics are non-digestible foods that make their way through our digestive system and help good bacteria grow and flourish. Prebiotics keep beneficial probiotic bacteria healthy. They can then multiply faster in the gastrointestinal tract as prebiotics selectively feed probiotics. When prebiotics and probiotics are combined, they form a symbiotic relationship, because they contain both live bacteria and the fuel in the form of the prebiotic that they need to thrive. It is essential that we get the balance of our intestinal flora functioning properly as it is thought to have dramatic influences on the human body. It is considered that this alone can affect our personal state of health and well-being and is also considered to be a key factor in our longevity. Remarkable results with Wise Owl’s Probiotic. After months of digestive issues & trying all sorts, from strict dietary changes to proton pump inhibitors, I have finally got on top of it – if only I’d tried this before! I feel so much better in myself as well! 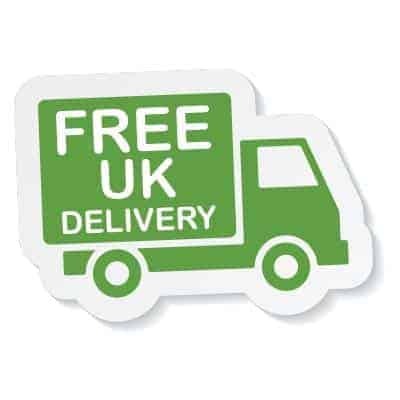 I’ll be ordering from Wise Owl again – brilliant products, good website, excellent customer service & v fast delivery! Highly recommend.